There are some interesting new products from Logitech coming up in April 2018. 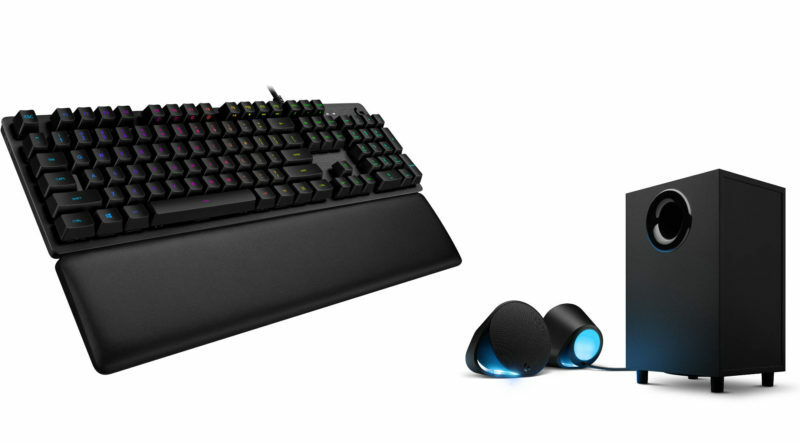 In its latest press release, the manufacturer announced the Logitech G560 Gaming Speakers and the Logitech G513, a mechanical gaming keyboard with Lightsync RGB support. The keyboard almost looks like the Logitech G413, but features RGB lighting and has a palm rest included. Furthermore, Logitech now gives the buyer the choice between Romer-G Tactile and Romer-G Linear switches. Up until now, all devices from Logitech only had Romer-G Tactile switches. The new Romer-G Linear switches are similar to Cherry MX Red but have a shorter travel distance. Expected life span and average force are identical with the Romer-G Tactile switches. The Logitech G513 is expected to be available at global retailers beginning April 2018 for a suggested retail price of 149,99 USD. The gaming speakers from Logitech provide 240 Watts Peak (120 Watts RMS) power and feature DTS:X Ultra for in-game positional audio. Sources can be connected via 3.5mm, USB or Bluetooth. Furthermore, the speakers contain some LEDs, which illuminate the room via Lightsync. The lighting will be adjusted to different situation in games and shall deliver a unique gaming experience. The Logitech G560 has a suggested retail price of 199,99 USD.